“It is almost impossible for us to imagine the horror of surgical operations before the discovery of methods for putting the patient to sleep. Operating rooms were usually located in separate buildings or in towers so that the other patients in the hospital would not hear the screams of the patient. It sometimes took as many as six husky men to hold the patient still. Because of the terrible pain, the surgeon had to operate as swiftly as possible. But speed made for poor surgery. Think about that. Modern surgery was impossible before anesthesia. I suppose I was a peculiar sort of little girl, but I found this fascinating. The book went on to talk about Dr. Crawford Long, who in 1842 was the first surgeon to perform an operation under ether anesthesia, in the town of Jefferson, Georgia, about 60 miles northeast of here. The author wrote about new anesthesia gases like – wait for it – cyclopropane, and explained how anesthesia gases are safer if oxygen is mixed with them. Good to know! Fast forward about 20 years. When I went to medical school, although I enjoyed nearly all my clinical rotations, there wasn’t any doubt in my mind by the end of the third year that I wanted to go into anesthesia. It really is a great profession! 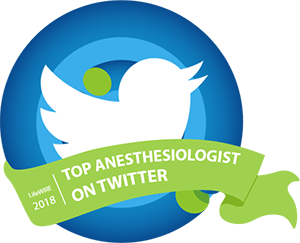 For anyone who might not be familiar with our field, we can sum it up by saying that in anesthesia we take care of patients while surgeons try to fix them. It’s not only a matter of preventing pain and awareness. We take care of the high blood pressure, diabetes, asthma, or any other medical problems our patients may have. We have to know a fair amount about internal medicine, and pediatrics, and birthing babies. And we must learn about each different kind of surgery, and how to tailor the anesthesia to the operation as well as to the patient. People often think that anesthesia sounds sort of dry and technical. It’s true that there is a great deal of detail to learn, about drugs and techniques. You might even think that there’s not a lot of human interaction, or connection with patients. But let’s take a closer look. This year I have the honor of being the president of the California Society of Anesthesiologists. Our tagline is “Physicians for Vital Times.” Because in anesthesia, we are with patients at the most vital times of their lives – childbirth, surgery, intensive care, and sometimes even at the moment of death. Think about the parents whose child needs surgery. The problem may not be that serious – maybe the surgeon needs to fix crossed eyes or take out tonsils. But the parents know, deep down, that though the surgery may be minor, the anesthesia is not. And when we take that child into the operating room, we must always remember the trust those parents are placing in us, to keep their child safe to the very best of our ability. It’s humbling, too, to think of the times that patients are looking up at us just before they go under anesthesia. Think of the terrified young mother in labor, who knows that her baby is in distress, and that she needs general anesthesia for an emergency C-section. Think of the patient who’s been in a terrible accident, or a victim of violence. There may be times ahead – and I hope there will be mercifully few of them – when your voice may be the last voice a patient hears on this earth. It matters what we say, and even more, it matters how we say it. When I started my anesthesia training, most patients came into the hospital for surgery the night before, and we would do preoperative visits without any time pressure. Those days are over! Today we’re lucky to have 10 minutes to complete a preoperative history, examine the patient, discuss anesthesia, and document it all in the computer! Yet those 10 minutes are vitally important to that patient. How we handle that interaction makes all the difference in whether our patients feel safe putting their lives in our hands. We’ve made anesthesia very safe, and we’ve made it look easy – maybe too easy. People can forget that when anesthesia goes wrong, the results can be deadly. In my role as CSA President, I have been sounding the alarm for better anesthesia care for children in dental offices. You might have seen me on TV last month, with NBC reporter Kate Snow, talking about tragic cases of children who died, or suffered permanent brain damage, caused by anesthesia gone horribly wrong in the dentist’s office. Can you imagine taking your child in for a dental procedure, not knowing that the dentist would be giving general anesthesia while doing the dental procedure? That there would be no anesthesia professional there who could rescue your child’s airway in an emergency? It seems inconceivable, but it happens every day. One of the keys to safe anesthesia is the concept of the anesthesia care team, where physician anesthesiologists work together with residents, nurses, anesthesiologist assistants, and technicians. Two heads often are better than one, and there certainly are times when you need way more than two hands! That is one reason why I’ve been such a strong supporter of CAA practice for years, because I know you believe in the care team concept as much as I do. There are so many of us in California who would love to have CAAs working with us every day. We are working to make it happen! Unfortunately, it’s tough in the blue states, where politicians tend to be in the pockets of unions, and nurses’ unions are powerful. But we’re not giving up! Right now, we are starting plans for the first AA training program in California. We have every hope that this will be the pathway to educate our lawmakers about AAs, and to demonstrate the quality of AA training. Ultimately, we will move California toward the goal of full CAA licensure. And on that note, let me emphasize a message that I know you’ve heard before: Money is the mother’s milk of politics. I am so happy to hear that the AA students here at Emory understand this fundamental truth: that no advocacy effort can succeed without money and hard work at the grass roots level to back it up. Please continue to be involved. Keep up your AAAA membership. It’s your professional association, and it has your back. Get involved in committee work. Donate to your political action fund. That is the only way we can continue to expand CAA practice, in California, and across the entire United States. What advice should I leave with you? Let’s start with the Golden Rule – treat your patients as you would wish to be treated. Use plenty of local anesthesia before any needle stick, and if your patient says ouch, use more. The most difficult patients are nearly always that way because they’re deeply unhappy, or in pain, or frightened. Our challenge is always to be kind, no matter what. Please don’t go up to the bedside of patients 30 or 40 years your senior, and start calling them by their first name. They weren’t brought up that way, and they may not like it. Say Mr. or Ms. unless the patient specifically asks you to do otherwise. Saying “Yes sir” or “Yes ma’am” doesn’t hurt either. Now that I think about it, you probably already have good manners because we’re in the South, but I can assure you that in Los Angeles this is not always the case. When you meet your patient in the preop area, after you’ve properly introduced yourself, what’s the first thing you should do? Please don’t say “put on gloves”. First, wash your hands. Then, touch your patient. Make human contact. Shake hands, or touch your patient’s arm. Listen carefully to the patient’s heart and lungs. You don’t need to wear gloves for any of this. Even the World Health Organization says you should NOT wear gloves for contact that doesn’t involve blood, or mucous membranes, or body fluids. You just need to wash your hands before you start and again when you’re finished. Human contact is such an important part of anesthesia care, no matter how brief it may be. It matters to your patients, and you may be surprised how much it will mean to you over time. Learn to enjoy the company of surgeons. Many jokes are made about surgeons. “Often wrong, but never unsure” is one of the more repeatable ones. Some of the more malignant and abusive traditions of past surgical training have eased up, so they’ve become less arrogant. But a surgeon still needs to have a sense of confidence and a certain amount of nerve. Male or female, they often think of themselves as the captain of the ship. The way to deal with that sort of personality is with grace and a bit of humor. In anesthesia, we need the right balance of backbone and flexibility. Don’t worry too much about work-life balance, whatever that is. The term doesn’t even make sense to me. The opposite of work is leisure. The opposite of life is death. If you feel that you’re only living when you’re off duty, then I would respectfully suggest that you need to find another job! 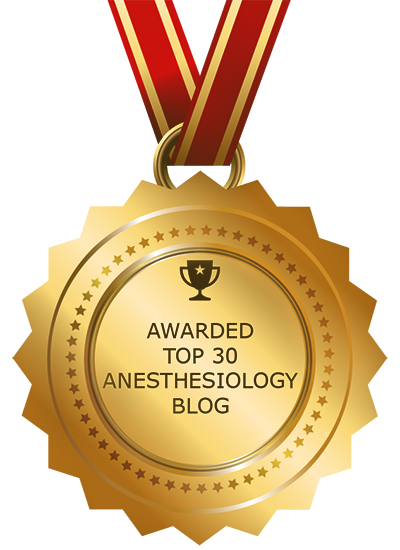 Anesthesia is a great profession – endlessly interesting, always evolving. Of course, you need time for family, for exercise, for leisure. Especially in the years when children are small, it can be tough to juggle all your responsibilities. But satisfying work is a fundamental component of a life well lived. It’s OK to lean in to your career! Always keep learning. That’s what keeps it interesting. Go to a workshop and learn a new technique. Make yourself learn to use the next new drug – that’s the only way you can decide how and when it’s worth using. In giving anesthesia, in taking care of our patients, we have the opportunity and the responsibility to be part of the whole cycle of life, to look beyond ourselves. What we have in common as human beings will always be more important than our differences. I wish you great joy and every success in your years ahead, and I thank you all for the great pleasure of being here today. 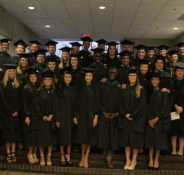 Dr Sibert, thank you for posting your Emory AA commencement speech. The Class of 2017 is special to me because I interviewed them as applicants and taught them in courses and clinic at Emory. I left in January for a position at Indiana University, and could not return for the ceremony. Reading your words and looking at photos posted by graduates bridged the gap somewhat. The inaugural IUSM AA class will start in two weeks! Dr Adams worked toward making it happen on many fronts. I look forward to progress in Cali. My sister and her family live in Venice. Maybe some day . . .
I’m grateful to have met you at this graduation ceremony and to have heard, and now read, your wonderful Commencement address. I know that I shall enjoy following your blog. It was such a pleasure to meet you as well! Congratulations on your award, and do enjoy your well-deserved free time! Thank you for the words of wisdom and encouragement for the Emory AA Program graduates. We appreciate your leadership and example of professional advocacy! that commencement speech was the best thing Ive read in a long time. Wisdom at every point! Thank you for all that you do for our profession and cant wait to work out there in California soon!